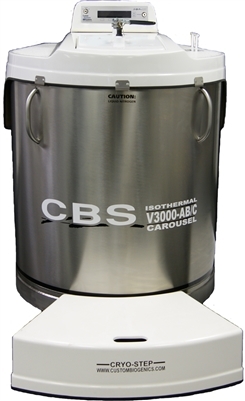 Custom BioGenic Systems V5000EH-AB/C Isothermal Carousel Liquid Nitrogen Freezers offer liquid nitrogen storage temperatures without liquid nitrogen contact. Liquid nitrogen is stored in our patented jacketed space in the wall of the freezer. This technology offers safe dry storage for your samples. With no liquid nitrogen in the storage area the risk of cross contamination and the safety risks associated with the handling of liquid nitrogen are greatly reduced. Our built in carousel can be safely rotated with an external handle, there is no need to reach inside the freezer and our square lid opening won’t restrict access to square racks. All Isothermal Carousel freezers use our time tested and reliable 2301 controller with a dual temperature display, autofill and many additional features. Custom BioGenic Isothermal Carousel Liquid Nitrogen Freezers have an industry best temperature gradient that averages -193°C inside the storage area.